3.9 out of 5 based on 92 bloggers and 10 commenters. 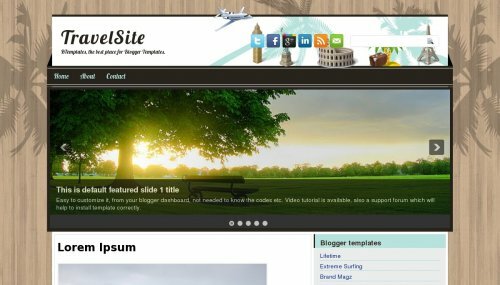 TravelSite is a free blogger template with 2 columns, right sidebar, footer columns, slider, social bookmarking icons, well designed threaded comments and vectorial elements. how can I put a dropdown menu ? Please. You need to search one script to do this, there are a lot of them. Then, adapt the html and css. That is verry nice template! Is there a possibility to convert this templace to html, css ? Can I change the pictures in the slideshow? How to change the pictures in the top slide show and put my own pictures? I’m super dumm. I can not put the images rolling or the social media links. Can not find the link you mention for help as well. how do i edit the outer wrapper to add about and contact, etc?